Kootenai Country Montana is full of fishing fanatics. It’s just the way it is here. They come in all varieties. On a given day, a lone Montana outdoors woman flips her ponytail through the back of her baseball cap and ties on a fly to match the hatch on the Kootenai River, a blue ribbon trout stream. She masterfully whips the floating line in a serpentine fashion, and gently lays the hand tied fly beside a large boulder. All while looking up at the high peaks of the Cabinet Mountain Wilderness, as her fly skirts the boulder and meanders downstream with the current. On that same day, a young family enjoys a lakeside picnic. The kayaks are pulled up on the beach, as Dad spin fishes and Mom and the kids swim and laugh. Miles away and diagonally across the county, two gray bearded fishing buddies of many years troll kokanee salmon flashers from the boat and laugh together about the passing of their youth. High up in the Cabinet’s, three young men sit around the base camp fire eating fresh trout with their hands, micro brews cooling in the alpine lake, brought up in their backpacks just for this occasion. What they all have in common is an appreciation for fishing that is almost a code of life in Northwestern Montana. Some locals refer to it as the five F’s of fishing. First, you gotta have fun! Secondly, fishing is a great family activity. It gives us a chance to bond together and share unspoken love, despite any differences and the insanity of the modern world. Next, fish are great food! There’s nothing like fresh fish and they are low fat, highly nutritious meals. Then there’s the fame. Truth being we all as human beings have ego’s, and it sure feels good to catch a lunker! 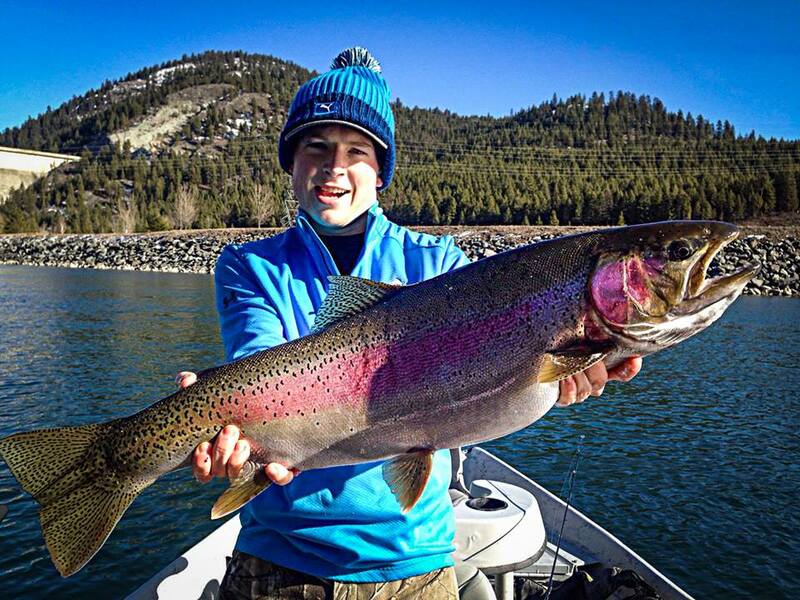 Kootenai Country is home to many record catches including state record rainbow trout. And lastly, fortune. This is measured not by gold pieces, but that incredible feeling of how fortunate we are to be here fishing! As the saying goes, "Even a bad day of fishing beats a good day of work." Fishing opportunities in Kootenai Country Montana are so vast it would be inappropriate to even attempt to cover it all in an introductory outline. But we can sure give you an idea. As you follow this website, we will elaborate on locations, methods, and species. And please don’t forget ice fishing! We have more than 150-named lakes and unmeasurable miles of creeks leading into and out of these lakes. 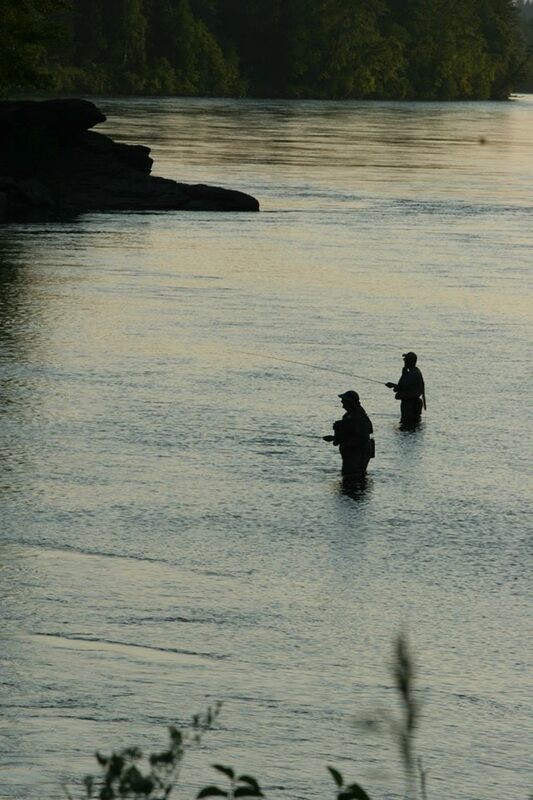 We sport seven major rivers which include: Kootenai; Clark Fork; Bull; Yaak; Tobacco; Fisher and Pleasant Valley Fisher. In a sparsely populated area like ours, you can always find your own “magic” spot. Here are a few to try your luck on. Alvord Lake is accessible near Troy, and is a popular family fishing lake of 69-acres with bass, perch, and pumpkinseeds. Bull Lake is south of Troy off highway 56 and at 1,250-acres is one of our larger water bodies. Facilities include a Forest Service campground, boat ramp, and swimming area. Launch your boat and enjoy the views of the West Cabinet Mountains as you fish for kokanee salmon, rainbow and Westslope Cutthroat trout. Want a lake up in the Cabinet Mountains? It’s a moderate difficulty rating hike of about three miles up to Geiger Lake. This rugged alpine lake is 40-acres in size with steep rocky banks but the fishing is usually real good! 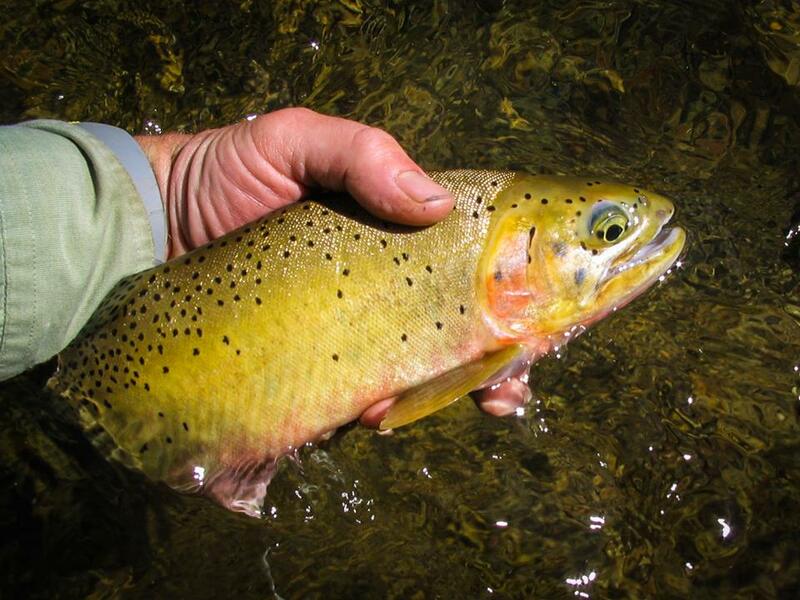 Try flies or Thomas Cyclones up here in the high country for rainbows or Westslope Cutthroats. Bring Grandma and Grandpa up to Howard Lake in the East Cabinet area. They like to fish too, and can probably teachyou a few lessons on fishing! This is one you can drive to, is about a 37-acre rainbow lake with bathroom facilities and is handicapped accessible. Middle Thompson Lake is in the Chain of Lakes area east of Libby near Happy’s Inn and is about 602-acres. A great all around fishing bonanza with kokanee salmon, rainbow and Eastern Brook trout. Middle Thompson is home to bass tournaments and a popular ice fishing lake. Looking for an exotic angle on angling? Try Horseshoe Lake in the chain for Tiger muskies or take a challenging hike up to Lower Sky Lakes for Golden Trout or rainbows. Find your fortune fishing Kootenai Country Montana with fellow fanatics and Good Luck!